I'll be grabbing this sometime later down the line. Need to finish God of War before moving on to another single player game! How does Wolf 2 compare to Doom on Switch as a game? I understand it's more story heavy and character driven. What else should I expect? I would say Doom is a little more arcadey and repetitive (in a good way though), while this follows story progression of an AAA game. More like Half Life with a crazy sci fi nazi backdrop. Both amazing games with tons of action and fantastic gunplay but Wolf also has a very engaging story and oppressive atmosphere. I'm so tempted to buy this. I really want a good FPS on Switch. I wish this had multiplayer or co-op of some kind. Both amazing games with tons of action and fantastic gunplay but Wolf also has a very engaging story and atomsphere. Cool, thanks. Does it eventually become possible to play individual missions after completing the story? Preferably with all weapons and powers unlocked? Doom has more varied weapons and enemies, more polished as an overall experience. I do think Wolf 2 is still quite excellent. The feel is different - enemies die fast and hit you hard, weapon fire and Ai behaviour makes it harder to avoid taking damage in some scenarios. Unlike Doom there is a stealth layer. I don't think it's done super well, but it's definitely distinct from Doom's feel. Interesting, thanks! It's kinda funny that in Doom 2016, while enemies can take quite a lot of damage, as a result of the new glory kill mechanic, the player can take even more. Game is still on its way to me from Amazon US. Doom makes much more sense as a portable game than this to me. I believe in areas of the game you can replay older missions but I have not progressed far enough to figure it all out yet. I enjoy both immensely playing portable. Doom was great because it was pick up and play, blast out an arena for a quick session. This is more like unfolding and tearing though new chapter of a book every time I return. To be honest I sorely miss this type of experience on Switch so it's a breath of fresh air to have some narrative and atmosphere progression amidst the chaos. Looks beautiful. I am impressed with this and hope we get more work from Panic Button, they do a great job. I downloaded this Friday and played it through the weekend (in portable mode)...it is a good game. Gunplay/charakter movement are very good and it looks nice too. I want to play this and Doom on my Switch in portable mode at some point, the only thing wrong at the moment is the price. I can't bring myself to pay €60 when I already have the PC versions, which I paid much less for in the first place. I'll bite around the €30 mark. I think I'm gonna download this tonight, if I was decent at DOOM in Nightmare mode (not Ultra-Violence) what difficulty should I be playing at here? Try the one above normal, adjust as needed. Ah you can adjust it easily? Good. I think hopefully the gyro controls will help me out too. I did my DOOM playthrough before they patched those in. Yeah just the pause menu lets you adjust. Need to finish the first game on PC before I buy/play this one. Good to hear the impressions though. I've been playing it a bit and my only real complaint so far is that the play timer counts time with the Switch in sleep mode. I don't have a ton of time to play video games, so if this takes me a couple months I'll have like 1400 hours racked up on it. I really enjoyed gyro doom. I'll buy this at some point. Backlog too large atm. Hope they port the first game. Do I need to make a US account for the mandatory download if I import a physical copy or will it work fine with my EU account? EDIT: to clarify, my eShop account is german and I'm not sure what happens since our version is censored to hell and back and doesn't have the same content as the US or other other PAL versions. Yep. MachineGames’ Wolf series is hugely story and character based. Old Blood isn’t super relevant in the grand scheme of things, but New Order should be required playing before New Colossus. Should be dirt cheap at this point. A player jumping into the sequel won’t be totally lost or anything, but you’re missing out on a lot of context that makes the character moments hit harder. Do a Google search "Nintendo Account" and you'll find a web page where you can see and change details of your account. There, you can change your region within your existing account. I recommend South Africa, it's the cheapest. Thanks, but I have no interest in exploiting their region free system to save a few bucks. I just wanna play the game in its intended form. Well, now that you are on it... You can choose the US as your region (Where you would also save a few bucks) or any other country that isn't Germany or Austria. I will be joining you guys later this week. Have a good time. Oh there are many coming. Looking forward to it. Really impressive port. It looks like a blurry, vaseline-smeared version of the same game, which is no small feat considering the hardware. It made my train to work go by in a snap. I really love living in a world where I can play games like this on a handheld. Unfortunately it doesn't seem to be selling all that well on the Switch in the UK like I presumed. I wanted it to of course but couldn't imagine a scenario where it would. 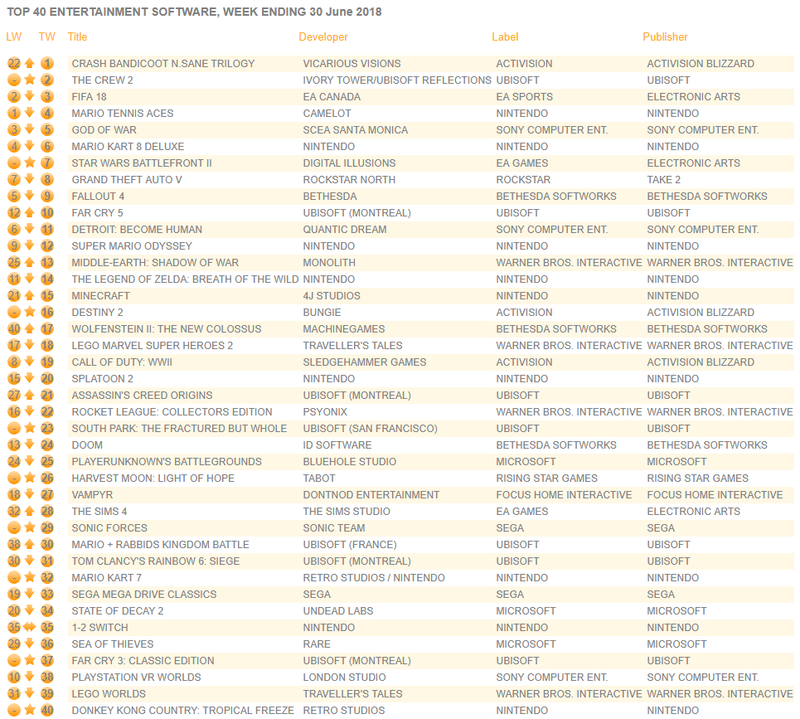 The Switch release pushed it up 23 spots, isn't that fairly decent for what this is? I don't think anyone expected this to move significant units at all. I have spent the entire weekend with it and it’s been a blast, though visually it is far blurrier than Doom. Playing portable only atm. One thing that really bothers me is that you can’t reset the gyro view with a button which is a glaring omission - i still use it but it’s nowhere near as pleasant as Doom - surprised nobody clocked this yet. Otherwise the game is a lot of fun. Really pleasantly surprised how much it hooked me. The story is pretty good all things considered and there are some really well written characters. Not really though, It's 8th on the Switch chart on it's debut week. It has been outsold by Splatoon 2 which came out even before Wolfenstein 2 originally came out. Put maybe 3-4 hours in this weekend, mostly in docked mode. I loved New Order and love this one. Don't get all the hate the base game was getting in some corners. Enjoy the run and gun gameplay mixed with some stealthing around. The gyro controls click WAY more than they did for me in DOOM, mostly because the slower, take cover, look down sights type of gameplay (DOOM's was a lil too frantic for me to get into the gyro a ton). I think it looks fantastic, framerate was super stable (just had one weird drop after being knocked down and it was just a 0.5 second stutter, everything else has been butter smooth). Played the New Order and DOOM maxed out on my PC and this is just as enjoyable to me (never been overly picky though). My one complaint about the gyro controls in Doom/WolfII - I wish I could have the X-axis left to right aiming done with a tilt to the proper side, like how I have it set up on my steam controller. Physically rotating the controller left to right isn't very comfortable, so mostly just use gyro on the Y-axis aiming. Love the characters, love the story, love how cathartic killing Nazis and KKK members feels. Can't wait to get home and put more time in tonight. Hmm I guess, though I think the Octo expansion might be boosting Splatoon 2 a bit. But still, I don't think many people expected this to sell well at all, it's certainly no Skyrim and it hasn't even had good word of mouth like DOOM. Moving up significantly in the charts is a decent sign. Especially considering the UK is currently the weakest region for the Switch. I don’t really expect great things for Wolf 2 sales, but comparing the sales to a flagship title of the system and in the UK seems a bit odd. To those using gyro, how does it compare to Splatoon? I can’t play Splatoon lying down cause of the way it’s set up but I love using gyro. Do Doom and Wolf 2 work lying down? Or is this an inherent issue with gyro aiming. Also, why on earth don’t more PS4 games implement gyro aiming? Seems so bizarre. Splatoon did a great service to gamers convincing them of the control method. Do you need to play the first game to enjoy this? I would play first game(s) after this, since to me it feels like TNO, Old Blood has better controls, damage feedback, not 3 hours of cutscenes and I like it far more....just an opinion. Wolfenstein 2 didn't sell well originally anyway, and it's releasing at the same time as Crash; a game that offers far more value for money. Not surprising that it's off to a slow start. I expect that it'll do alright in the long-run though, especially as the price starts to come down. DOOM started off similarly slowly, but has since done pretty well on Switch. Very good! Would have been cool to see split joycon motion aiming as well (eventhough it's the same), but regardless... I'll probably get the game now. Without gyro-aiming, I would not, especially because it is on switch. Something like this has to always be implemented in Switch FPS. That is pretty good though? I expected it to settle more at 20. I mean its a overpriced old port. People complain about the cutscenes but at the end of the day you can skip all of them and this has more "pure" gameplay than TNO. People have forgotten all the interruptions and gimmicks that game had: gimmick vehicle levels, stealth-only sections and quite a few Half-Life/COD-esque cutscenes where you had to wait for characters to finish talking before you could advance. Shootbang during the middle part of the game slows down to a halt as it throws all of these at you including the hub world intermissions where you don't do much except complete fetch-quests. By comparison Wolfenstein 2 is a lot more Wolfenstein-esque despite all its flaws: you get plopped onto a level and shoot/stealth kill your way through Nazis, even more so with the addition of the district side-missions. Outside the scripted into cutscenes and that moment half-way through there's no padding or gimmicks to waste your time. God I can't wait to jump back in tonight. The game itself was pretty great, I don't know why it got so much hate. Difficulty was fine, I played at the 2nd highest difficulty setting and never felt it was too much, I easily could've played this at the highest. Is this just an educated guess? Let's put it this way. It bombed on PS4/X1/PC severely with a big launch promotion during the holiday season. TBH I'm suprised Youngblood is even a thing on any platform. It was never going to break any sales records on Switch so we should just be glad we got it and enjoy it. All versions were patched to be easier at the beginning of the year. The Switch version is simply using the patched values.